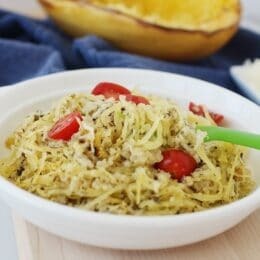 Delicious and simple Superfood Spaghetti Squash recipe. 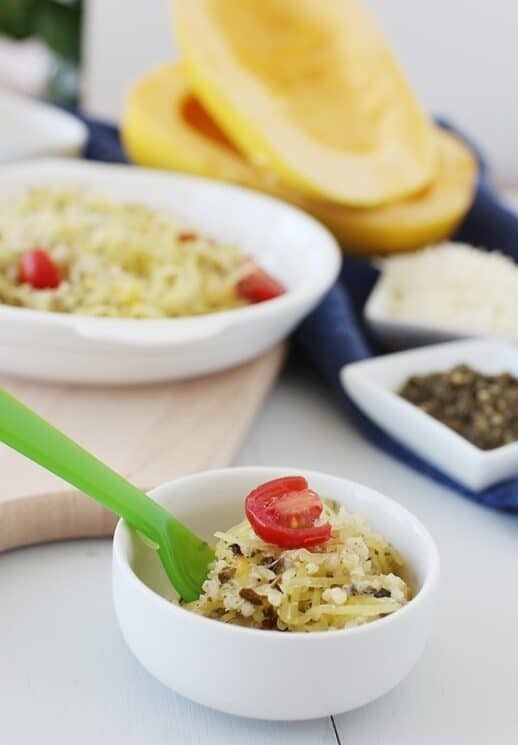 The nutrients found in spaghetti squash make this the perfect super food, along with quinoa, pesto, and tomatoes! Check out our Ultimate Guide to Spaghetti Squash for TOP tips on cutting and cooking spaghetti squash that you won’t find anywhere else! There are foods that she loves and WILL eat, and something I try to do is pair that familiar food she loves with something new. She really loves quinoa with pesto in it. Who would have thought? Since quinoa is such a super nutrient dense food, I thought it was the perfect thing to stuff our squash with! 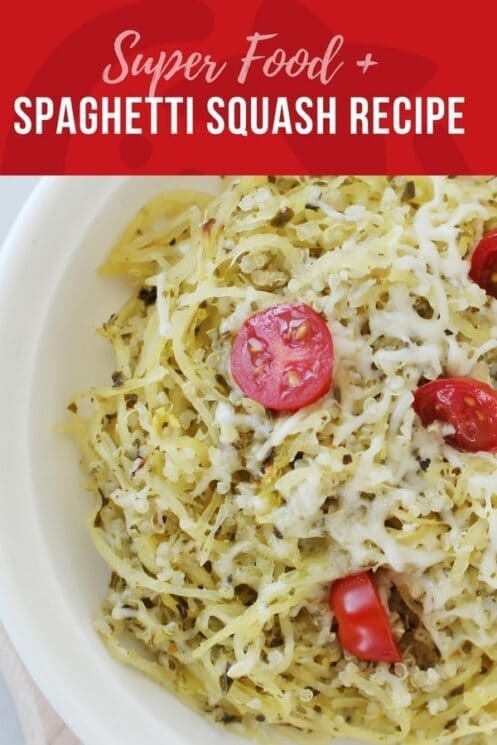 Add savory pesto, tangy tomatoes and some gooey cheese on top, and you have a power packed delicious dinner all in one spaghetti squash recipe! One great reason to include spaghetti squash into your family’s diet is that they are so nutritious. The nutrition density of a food considers the micro-nutrients related to total calories. So if a food has lots of nutrients and is low in calories, it’s a nutritionally dense food. In contrast, an energy dense or calorie dense food generally refers to a food that is high in calories, and low in nutrients. This distinction is important, because the more calorie dense foods kids consume, the more likely they will be too full to get the optimum amount of micro nutrients. Good source of Vitamin C : 19 mg or 32% daily value for 1 cup. Good source of Potassium: 895 mg or 26% daily value for 1 cup. Fiber: 6 grams for 1 cup! small amounts of omega 3, Vitamin B1, copper, Tryptophan, vitamin B6, panothenic acid and Niacin. 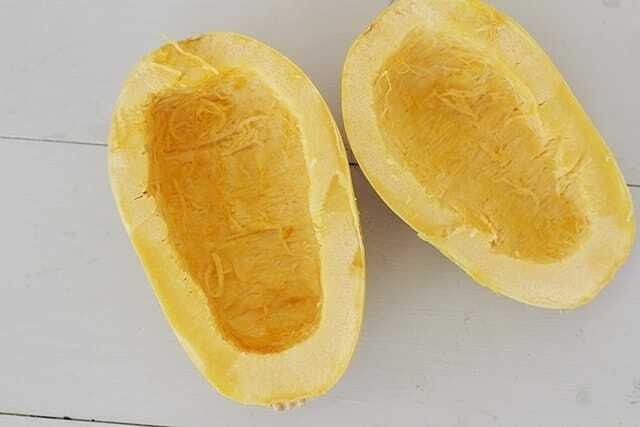 If those nutrients aren’t enough to get you cooking your next spaghetti squash recipe, winter squash (like spaghetti squash) has one of the most concentrated sources of Alphalinolenic acid (ALA), that gets converted to EPA (the fatty acid shown to reduce triglycerides). This spaghetti squash recipe does not require a lot of effort. 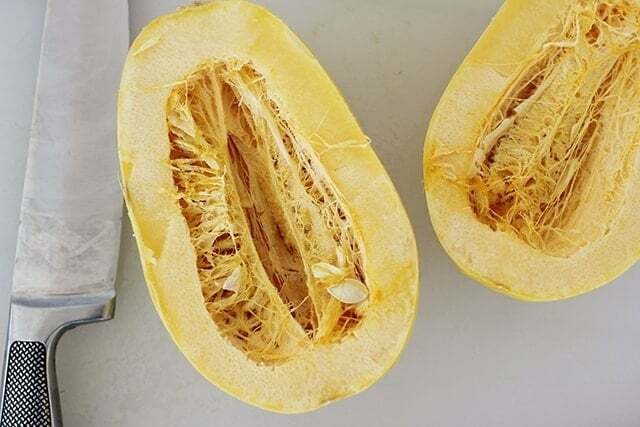 To cook spaghetti squash, all you have to do is slice it in half (the hardest part), scoop out the seeds, turn over face down and bake! I sprayed my baking pan with a bit of olive oil so that it wouldn’t stick. You can also use a silpat which is awesome because nothing sticks to it! While the squash is baking, prepare your quinoa. This is the method we use to cook super fluffy quinoa. Once cooked, add your pesto. Chop your tomatoes and combine with the quinoa. Once the squash is done baking, fill it with your quinoa mixture. Layer with some fresh mozzarella, and a little basil. Put it in the oven on broil just for a couple of minutes to melt the cheese, and serve! Each of the ingredients provides different nutrition, flavor and texture to this dish. Providing your kids with variety not only helps them get all of the nutrients they need, but also helps to expand their palate and grow to love different foods. You never know which method of cooking a fruit or vegetable will be the one they like! Slice spaghetti squash in half lengthwise, and scoop out the seeds with a spoon. Place on a baking sheet, either with a small amount of oil or lined with a silpat. Bake at 400 degrees F for 30-40 minutes or until the rind is soft and the squash easily pulls away from the rind. Shred the squash. Meanwhile, cook quinoa as directed on package. Halve or quarter the tomatoes. Once quinoa is cooked, add the squash, tomatoes, and pesto; stir to combine. Spoon back into the squash rind and layer with fresh mozzarella. Place in the oven under broil for 1-2 minutes, just until the cheese is melted. Spoon onto plates and serve with kiwi slices. Do you suppose this would work with butternut just the same? Do you just “shred” the squash into spaghetti strands as you eat it? Or could you do it before broiling, and pre-mix it with the quinoa pesto mixture? You can do it either way! Kiddos did not like. Hubby said it was weird, but good. I thought it could use more sauce but otherwise I enjoyed it.